Is it The Bible or is it Shakespeare? Six of One: A Tudor Riff is going to be a big sister! I am JoAnn Spears, the author of Six of One: A Tudor Riff. Six of One was originally conceived as a stand-alone work. After two years, the idea for a sequel unexpectedly came along. Seven Will Out: A Renaissance Revel is due out in Fall, 2015. 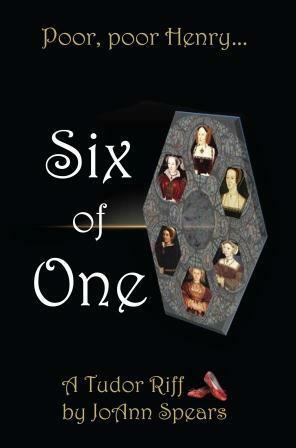 Six of One is a comic, alternate-universe, chick-lit spin on the story of Henry VIII and his six wives. Seven Will Out takes the story to the next generations of Tudors and features Elizabeth I, ‘Bloody’ Mary, Mary Queen of Scots, and Bess of Hardwick, to name a few. Six of One is available in paperback or e-book on Amazon.